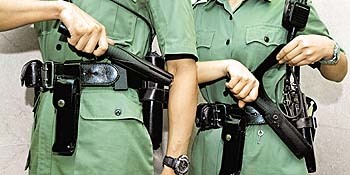 Some 100 new baton pouches have been distributed to a host of formations, including the Emergency Units of the five land Regions, for a two-month trial. The study was part of the drive to improve frontline officers' equipment and working conditions. Support Wing Superintendent (Field) Felix Law Chuk-hung said the new design was garnered taking into account views of Weapons Training Division and frontline officers. "Drawing their batons from existing nylon pouches, officers have to open the cover flap first. Also, the design only allows them to draw it vertically," he said. The new pouch, made of durable and elastic fibre, solves the problems by allowing officers to draw the baton through its open top and side break, providing quicker, easier access and a smoother, faster draw both vertically or horizontally. The open bottom also allows officers to holster their baton fully extended. The design gives multiple positioning options, allowing for a lot more comfort, particularly when sitting. Manufactured locally, the pouch was specially designed for the Force, the only one of its kind. 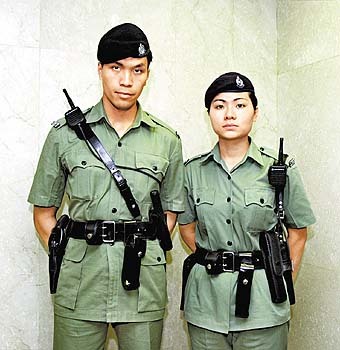 EU HKI Police Constable Yeung Yu-leung and Woman PC Chow Ka-man said the new pouches improved their efficiency in handling the batons and greatly improved comfort. The pair also liked its modern appearance.